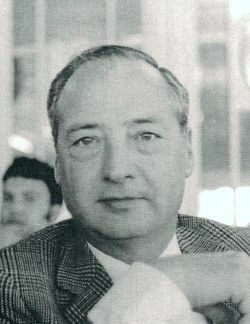 Fidel Trias Pagès was born in Sabadell on the 18th of November 1918. His vocation as an artist became clear early on, and at the age of 14 he matriculated in the Higher Fine Arts School of Barcelona. In 1936, with the outbreak of the Civil War, he was required to leave school and abandon his incipient career as a painter. However, after the war, he once again took up his paintbrushes and embarked on a career as an artist that would not be interrupted until his death in 1971. He held his first exhibition in 1942 at the Sabadell Fine Arts Academy, where he would continue to show his works over the years, and with which he would forge ties as one of its most active members, at times that were particularly critical for the survival of this Sabadell institution. In the ensuing years he also participated in a show in Madrid (1945) and showed his works at Friends of Art of Tàrrega (1947). During this early period, his paintings were basically made up of portaits, floral motifs, landscapes and still lifes. In 1952, his participation in the Exhibition of Liturgical Art held in Barcelona with the motive of the 35th International Eucharistic Congress marks the inclusion of religious subjects in his works, which would came to gain prominence until they become the main bulk of his work, as captured in a series of murals. The first of these works, the chapel of the Most Holy Sacrament in Sant Feliu del Racó (rendered between 1952 and 1955), reflects the influence of his teacher Antoni Vila-Arrufat yet gives clear glimpses of a conception of religious painting that is profoundly personal and innovative simultaneously rooted in a tradition that mixes the Romanesque and the more recent Noucentista legacy. After he chapel of the Most Holy Sacrament in Sant Feliu del Racó, in the period between 1952 and 1959, he would paint religious murals in the vestibule of the Nen Jesús hostel, in the apse of the church of Bellaterra, on the main altar of the parish church of e Sant Llorenç Savall and in the baptistery of the basilica of Mare Déu de la Mercè in Barcelona. From 1960 to 1966, he painted the murals at Sant Oleguer church of Sabadell, the altar in the Verge del Roser in Sant Vicenç de la Creu Alta, the main altar in Sant Feliu del Racó, the convent church of the Provincial Board to Protect Minors in Sant Llorenç Savall, the main altar at the Church of the Salesians on Barcelona's Rocafort Street (in collaboration with Raimon Roca) and the Altar of the Martyrs at Sant Genís de Vilassar church. Of all of these works, unquestionably the most important is the mural in Sant Oleguer in Sabadell, a newly-built church opened in 1961 where apart from making the entire mural painting inside, Fidel Trias also designed and supervised the manufacture of the stained glass windows, the sgraffito, the canopies, the Stations of the Cross, the candelobra and the linens for the altars, and he also decided on the colours of the walls, the wooden details and the ironwork. 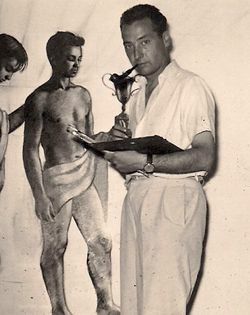 Between 1952 and 1958 as well, he painted murals with non-religious subjects, including the ones at the Marcet factory in Sabadell, and the ones at the Bank of Bilbao in the same city. In the last years of his life, based on the new liturgical orientation of Vatican , ii, he had to give up religious murals and once again concentrate on easel painting, with a clear preference for portraiture. The concept is along the liens of a slightly expressionistic realism, resolved with a highly pared-down technique based on an energetic brushstroke and vigorous lines. One of the constant features in his murals is rigorous integration with the architectural setting. Arturo Llopis associates his murals with a desire to melt into the architecture, into the structure and moulds of the church, into its forms [....] by a minimal exposure of colourful elements, accumulating white, grey and mild tones in a harmonious composition, highlighting the outward appearances, grouping figures together with powerful, gravid draughtsmanship, despite the lightness and spirituality he lends to the entirety. ... it is of major consequence, in these times of facile brilliance, to be able to say that Trias Pagès has bravely chosen a pathway fraught with difficulties, with responsibility, and to faithfullly reveal, without intellectual concealment and with honesty, his possibilities and limitations; that is, the servitude and grandeur of his art.